Februarainy is a week old & just as grey as usual here in Vancouver. Not owning a car means we're going to get wet no matter how we travel--walking, transit, booking a Modo car, or biking. Biking is the fastest of our options for most trips, so it's our go-to choice. The kids don't really mind biking in the rain at all, it's only me who is hesitant. However, once I'm actually out there, riding, I don't mind the rain on my face. If the weather is wet, Bronte wears her Tuffo Muddy Buddy & Linnaeus usually wears his frog raincoat & Tuffo rain pants. I stay mostly dry with the rain cape I got at Bike Doctor, plus my leopard print gumboots. I say mostly, because the cape usually drips on my shins a bit when I get off the bike. It might sound like a lot of gear, but none of it is particularly expensive. 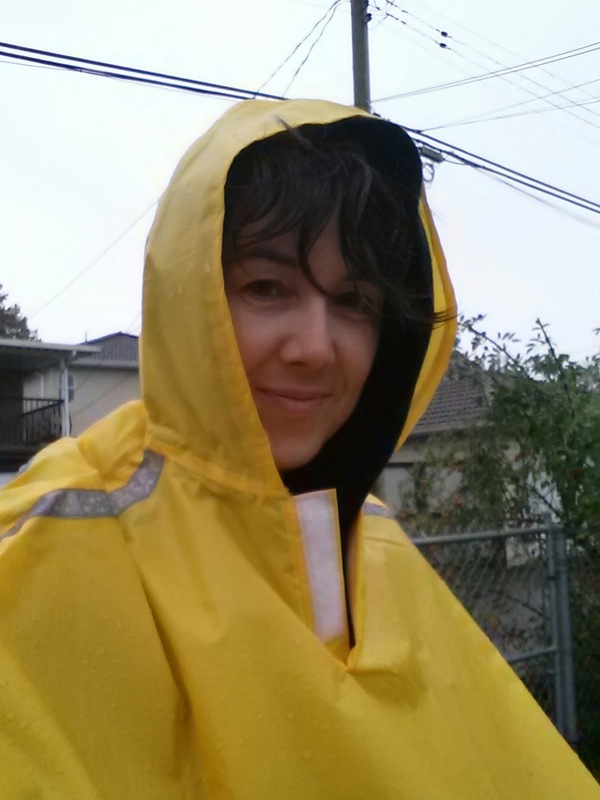 The Tuffo suits are $40 ($30 on sale at Wee Ones Reruns once or twice a year), the rain pants about $20, the rain coat was bought second-hand for $20ish, my rain cape was $45 & our gumboots were $15, $30, & hand-me-downs (thanks Natasha!). $160 for complete rain gear for three people isn't too bad, right? Besides the fenders that came with our Yuba Mundo, we've added a few little things to keep us & our stuff dry. The seat pads for the kids are fabric & foam, not waterproof, so I try to keep them dry. (Hey, Yuba--can you make waterproof versions of these?) If I can't find covered bike parking, I use the clear plastic cover that came with our toddler car seat to keep Bronte's seat & Linnaeus' Soft Spot seat pad dry. My seat can just be wiped dry, so I don't bother with a cover. If I'm riding more than a few minutes, I'll sometimes stick my purse in a spare plastic shopping bag in the Bread Basket in front, so it stays dry too. Total cost for these rain solutions: $0. When we carry anything bigger than what fits in the basket, we usually use the GoGetter panniers, which are heavy duty waterproof material. The big flaps on top keep everything dry & secure. These bags are not cheap--$250 for the pair--but I generally factor them & all the other accessories we got with the bike into the total cost, like you would with the trunk of your car. If you are looking for super low cost waterproof panniers for your bike, go to Instructables.com & search for bike bucket panniers. There are lots of tutorials for how to make them out of square kitty litter buckets or similar for less than $20. Do you ride rain or shine, or are you more of a fairweather cyclist? (don't worry, I won't judge!) Have you got some brilliant rain gear solutions that you love? Share them in the comments below--I'd love to hear from you!